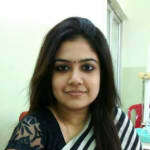 Dr. Neha Banerjee is a trusted Dentist in Ganguli Bagan, Kolkata. She has over 5 years of experience as a Dentist. She studied and completed BDS. She is currently associated with KPC Medical College & Hospital,Jadavpur and Iris Hospitals in Ganguli Bagan, Kolkata. Save your time and book an appointment online with Dr. Neha Banerjee on Lybrate.com. Lybrate.com has a nexus of the most experienced Dentists in India. You will find Dentists with more than 44 years of experience on Lybrate.com. You can find Dentists online in Kolkata and from across India. View the profile of medical specialists and their reviews from other patients to make an informed decision. Doctor is very patient and somehow always provides pain free treatment. I was very happy with the extraction process. Other doctors asked me to have a surgery but she removed my tooth in a single appointment. my experience was good. I had a filling done and the pain was gone in just a few days. She is communicative and explained tge treatment given to me. I was satisfied as tge doctor gave enough time to me for listening to my complains and discussed the various methods of treatment as well. From my childhood everyday i brush my teeth but still layers are present over it, somtimes bleeding occurs. Few people are more prone to plaque deposition may be due to poor saliva flow or crowded teeth. Brush twice daily and rinse after every time you eat . Scaling will remove the calculus but maintenance is up to you. Once the plaque is removed stick to maintenance. Also visit your dentist every six months. You can use a toothpaste x-tar for brushing. It prevents plaque formation. I have swollen lymph nodes around and inside my throat for more than 4 months. This all started when I got a mild infection in a wisdom tooth. Antibiotics prescribed by a dentist couldn't resolve this so I got Penicillin G prescribed a GP, they have reduced a little bit but they are still swollen. What should do to get rid of this ailment quickly? I am 31, had braces 2 years back however i wasnt very serious with the retainers after the braces were removed. So some gap has appeared. Can it be corrected by putting on the braces again. How long can it roughly take.Is age an issue? Yes age is a very important factor. In your case retainers were very important. If the spacing is generalized then there is no alternative other than wearing braces but if the spacing/gap is between two particular teeth you can go for composite fillings. Also consult your dentist regarding composite laminates.